Believe it or not, the Nintendo DS has been out for five years now. But the DSi? Barely even 6 months. 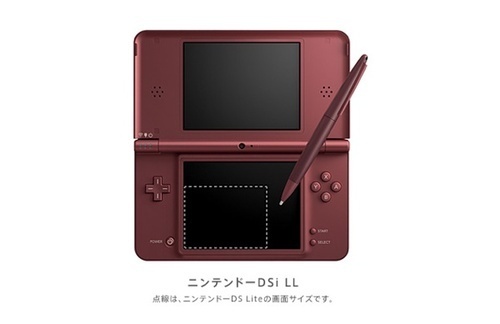 But that didn't stop Nintendo from announcing a brand new DS system called the DSi LL. This extra large version of the DSi features dual four inch screens, a bigger stylus, and a longer battery life. The screens themselves are the same resolution as the smaller screens of the DSi, so expect some truly pixelated looking displays. All other specs of the system are identical to the DSi - dual cameras, SD card slot, and clamshell design. The total weight of the system is 314g or about 11oz. The DSi weighs 7.5oz. 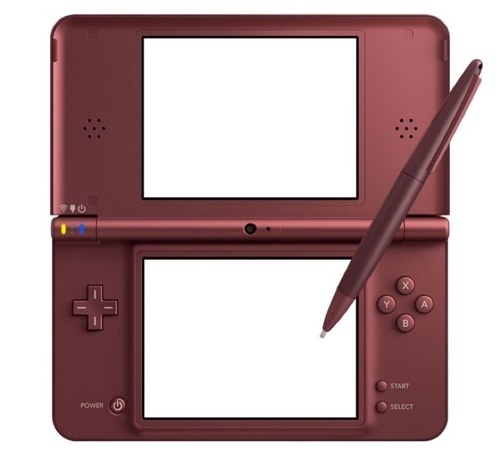 The DSi LL is bundled with two touch pens: one shorter and one longer touch pen (shown above). It'll also have three DSiWare titles pre-installed. Finally there are three colors: Dark Brown, Wine Red and Natural White. The system releases on November 21st in Japan for ¥20,000 (US$220). There's no word yet on a US release date. It's an interesting move in a time when everyone is trying to shrink their handheld systems. For me personally, I'd welcome the bigger buttons and stylus for less hand cramping - but then I remember holding the original DS and how it cramped by hand with the weight. I guess we shall see. Page created in 0.8366 seconds.